This Boeing 737-3K2, named 'Krakow', first flew on April 27, 1990. Its first operator was Transavia (of the Netherlands) that operated the bird for twelve years (occasionally leasing the Boeing to Air One). 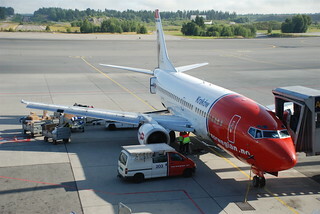 Since November 2002 the aircraft has been registered to Norwegian Air Shuttle.